Newcomer Family Obituaries - Jack J. Straub, Sr. 1927 - 2019 - Newcomer Cremations, Funerals & Receptions. 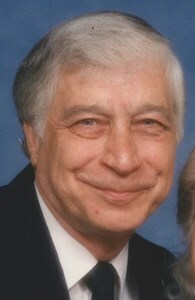 Jack J. Straub, Sr. age 91, of Sylvania, OH passed away April 4, 2019 at Flower Hospital. He was born August 31, 1927 in Union Town, Pennsylvania to Francis and Minnie (Gordon) Straub. Jack served his country in the U.S. Navy during WWII. He was employed with Art Iron for more than 35 years. In his early years, Jack coached CYO baseball for St. Joseph Sylvania and enjoyed bowling. In his later years, he stayed active by biking, walking and working in his yard. Jack is survived by his children, Dolores (Richard) Campbell, Jack (Bonnie) Straub, Jr., Jerome (Tamra) Straub, James (Nancy) Straub, Jeffrey (Mary Beth) Straub, Denise Crouch, Dorothy M. Straub, Darlene M. Whitcomb and Donna (Paul) Mavis; 22 grandchildren; 14 great grandchildren; and sisters, Katherine Lica and Garnet Brown. In addition to his parents, Jack was preceded in death by his wife, Norma Straub; son, John; daughter, Diann; and granddaughter, Lisa. There will be no visitation and services will be private. Memorial contributions may be made to St. Joseph Sylvania, Youth Programs in Jack's memory. To leave a special message for Jack's family, please click on the share memories tab above. Add your memories to the guest book of Jack Straub, Sr..
Dorothy, thinking of you and praying God will give you strength during this hard time. Please accept my deepest sympathy. May you take comfort from Gods promise to reunite us with our loved ones by means of the resurrection. Please accept my heartfelt condolences on your father's passing. May God be with you all during this time of great sorrow. Warren J. “Ren” Newcomer, Jr. is a licensed funeral director in the states of Kansas and Ohio. Theresa Newcomer is not a licensed funeral director. James Raczkowski, Managing Funeral Director.